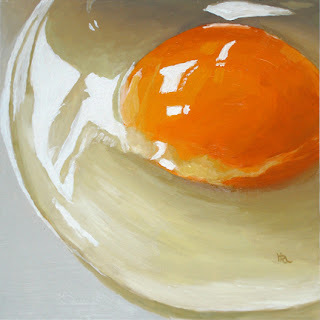 One of my first paintings that sold on my blog was of an egg in pastel. It was much more challenging to paint one in oils but that’s part of the reason I love to paint. I try to challenge myself daily and I hope I progress in mastering the medium. What an excellent egg, it looks so real! Ria, this is really nice… one can just stare at it. do more! this is gorgeous! I always liked your pastels, and you are very good in oils, too. I’d say you did just fine in oil. Very eye-catching painting. Like the sacks too. Very, very well done. I can feel the freshness of the egg. I really love this egg….Breakfast time!